I found this great little cutting board at my favorite Thrift Shop, Neverending Consignment. Of course I had no intention of using it "As A Cutting Board", and was pleasantly surprised to find that it had its own little legs (so I won't have to add any)! First I washed the cutting board. I use a hot soapy rag (Dawn Dish Soap) first to clean my cutting boards, and then spray on some Krud Kutter Kitchen Degreaser, just in case the cutting board is too oily for painting. 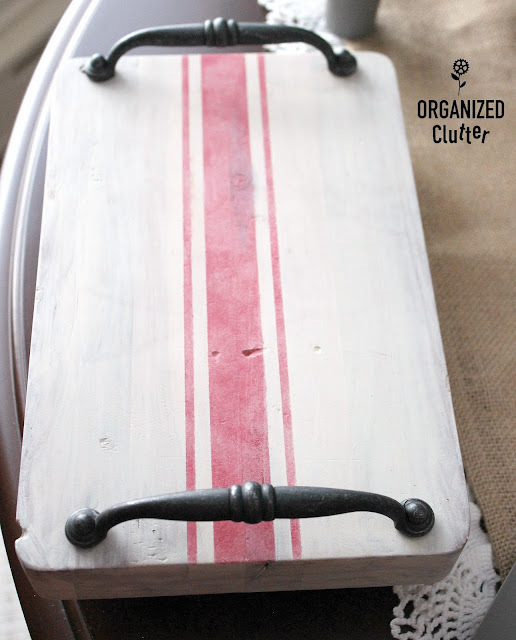 I then "white washed" and "dry brushed" the cutting board with watered down Dixie Belle Chalk Finish Paint in Drop Cloth. Basically, I used a pretty dry brush, dabbed on a rag, with watered down paint to make a wash. The combination of these techniques results in a transparent off white paint. Next I added three grain sack stripes using my *Old Sign Stencils Grain Sack Stripe G1-Thick Three Line stencil. These stripes add farmhouse/French Country style to any upcycle. 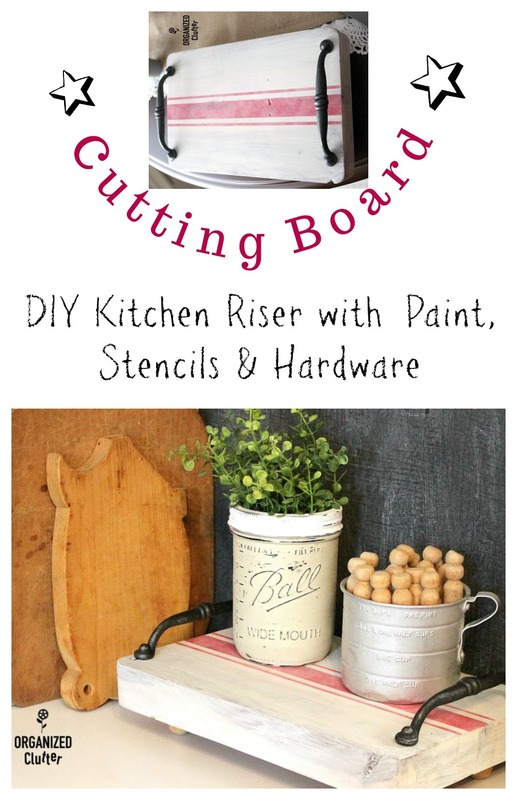 I centered the stencil on the cutting board, and used DecoArt Chalky Finish Paint in Rouge to pounce on the stencil. I also watered down the Decoart paint as well, and used a very dry brush, so the stripes were transparent as well. 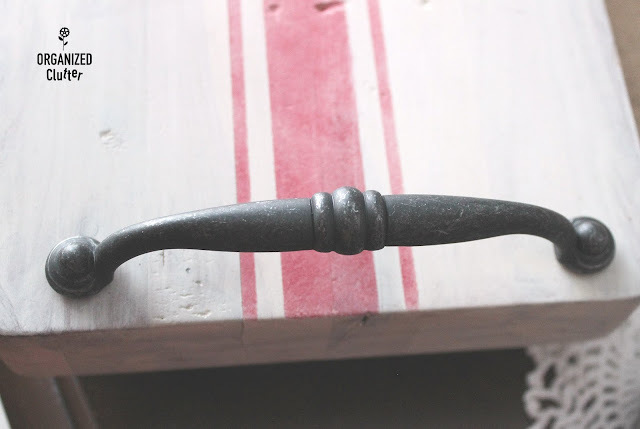 For additional whimsy/interest, I added two Menard's clearance rustic metal pulls to each end of the cutting board. If the screws provided are too short for the the cutting board width, you will have to countersink the screws a bit. 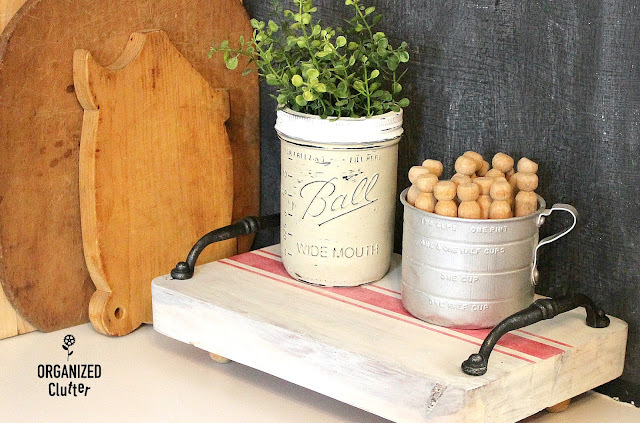 Check out clearance pulls when you are upcycling to keep the costs down! Sometimes they are just last year's models, and not awful. Here is the completed kitchen riser. I think it almost looks like a grain sack towel! I DID NOT use wax or any sealer on the project piece. I wanted it to have a very matte finish, and since it is a decor piece, it really isn't necessary. I will use the riser on a counter top or table top to add interest to my farmhouse style vignettes. I think it could also be used as a small tray. The riser looks great with vintage kitchenware and cutting boards. 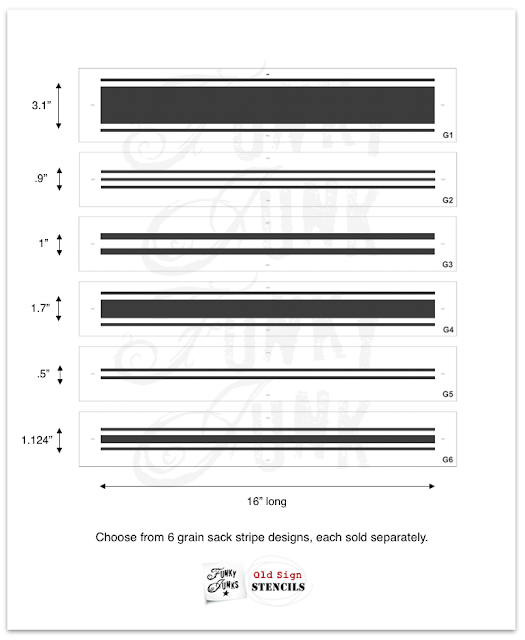 Scroll on for a chance to win the Upcycle Sharin' February Challenge. Welcome to the February Upcycle Sharin' Hardware Challenge! This months sponsor is D. Lawless Hardware. 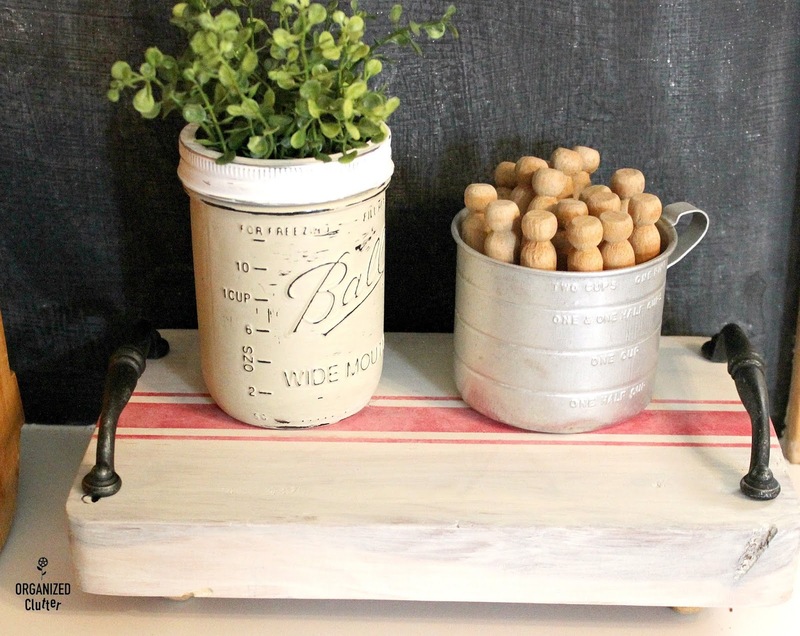 Whether you are updating cabinets or furniture, one of the best ways to give a refresh is with new hardware. 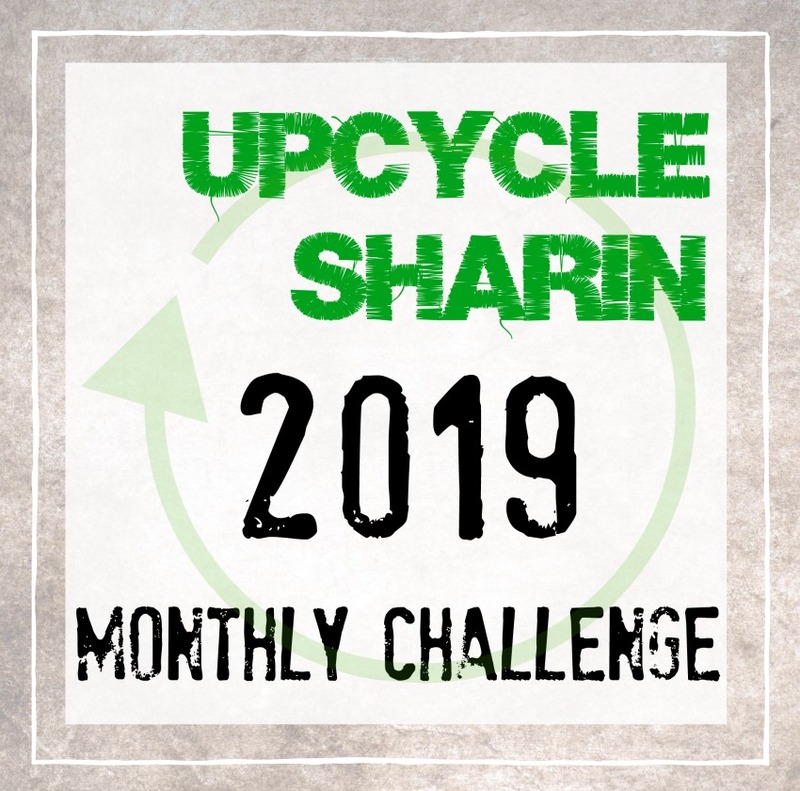 1)Join our Upcycle Sharin Group on Facebook where you can get updates to this challenge as well as finding an upcycle tribe. 2)Scroll to the bottom of this post and click add link. From there you can add your upcycle project that will feature this months theme - HARDWARE. It must include some form of hardware to be eligible. Note - You don't need to have a blog to enter your project. For details on how to do this, if you are unsure, you can check out this video in our group. 3)You have until February 15th to add your project. After that, voting begins. People can come back to this post and vote for their favorite project. Time to gather friends and family to help vote for yours, see more info on this post if needed. 4)The person with the most votes wins and will be announced on March 1st. 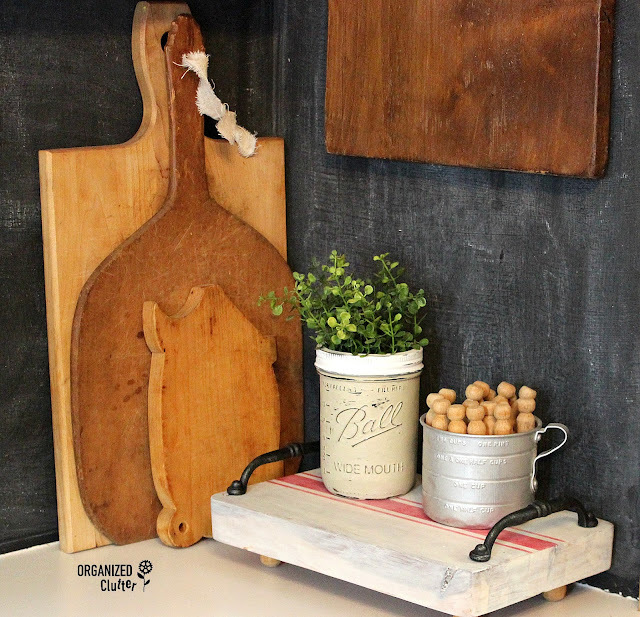 Check out projects from group admins Salvage Sister & Mister and Dukes and Dutchesses!